The 8-Series large capacity I.C. lift trucks offer significant advancements in durability, ergonomics, productivity and fuel efficiency, while meeting stringent federal EPA Tier 4-final diesel engine standards. "With our latest 8-Series model introduction, material handling customers will receive the next generation of power, leveraging Toyota's years of design and engineering experience," said Jeff Rufener, president of TMHU. "More importantly, our new 8-Series models deliver significant fuel savings without the sacrifice of performance-we believe this will keep Toyota at the forefront of the industry and at the top of our customers' minds." Powering the 8-Series is a new 3.0-liter, 4-cylinder diesel engine designed and manufactured by Toyota that delivers 74 horsepower and 221 ft-lb of torque. After two years of design for lift truck usage and rigorous testing, including 10,000 hours on the dynamometer, the new 1KD offers substantial improvements over the previous engine. The 1KD exceeds the performance demands of the harshest environments by providing the same power as an inline six-cylinder engine, while offering improved fuel economy and meeting EPA's Tier-4 final diesel regulations. Thanks to a newly designed engine that incorporates a modern common rail fuel injection system combined with an intercooled variable nozzle turbocharger (VNT), the 8-Series large capacity I.C. 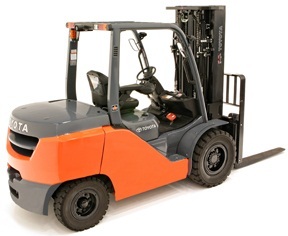 lift truck models offer quicker throttle response and precise control of the amount of fuel being injected and burned for greater fuel efficiency. The VNT, which boasts the smallest gas flow size in the world - 55kw class, results in torque increasing almost 10% compared to the previous engine while increasing fuel efficiency. On average, these models are 30 percent more fuel efficient compared to previous Toyota diesel models. This system works in conjunction with a Diesel Oxidation Catalyst (DOC), minimizing emissions and particulate matter. In addition, the DOC does not require any additional maintenance, resulting in less downtime and increased productivity. A programmable Auto Engine Off feature. This is similar to the Auto Shut-Off system associated with electric lift truck models. The Auto Engine Off automatically powers down the lift truck after a preset amount of time, making it ideal for customers that have to meet stringent regulations concerning diesel idling time limits. Emphasis on improving reliability and maximizing uptime was a key focus in the design of the 8-Series. The redesigned chassis features a fully stamped steel plate and a significant reduction in cosmetic sheet metal and plastic. Critical controllers and relays are protected in a sealed box and new water-resistant connectors help guard against damage when working in adverse weather conditions and corrosive applications. An improved cooling system will automatically reduce the engine's output if the coolant temperature rises to potentially damaging levels to help protect the engine against heat damage. Operator comfort was a top priority in the design of the 8-Series large capacity I.C. lift truck line. Ergonomic improvements have been made to the floor space, entry step, curvilinear overhead guard and steering wheel - all developed to enhance operator comfort. For example, new long dual operator assist grips help meet the needs of varying operator sizes combined with a lowered and enlarged first step to facilitate their entry and exit from the lift truck. Optional mini-lever hydraulic controls feature a three-way adjustable armrest to enhance operator comfort and productivity. And a redesigned wide-view mast, angled overhead guard bars and low profile cowl with sloped dashboard provide the operator with optimal forward and upward visibility. The 8-Series large capacity I.C. lift trucks offer Toyota's exclusive System of Active Stability™ (SAS), which helps reduce the likelihood of lateral and longitudinal tipovers. When the SAS system detects instability, its advanced sensors simultaneously signal and engage the appropriate controller. The Active Control Rear Stabilizer System and the Active Mast Function Controller System work in conjunction to add truck stability and help reduce the likelihood of a lateral overturn and decrease the chance of spilling a load or tipping the lift truck forward or backward. Additionally, for added operator safety, a vehicle travel speed control system has been incorporated, which helps regulate the lift truck's maximum travel speed to meet a wide range of operator skill levels. To provide optimal visibility while the operator is traveling in reverse, high mount rear lights are integrated into the overhead guard out of the operator's view and an optional rear pillar assist grip with horn button is offered to provide proper hand placement and comfort. The new lift trucks will be manufactured and assembled at Toyota Industrial Equipment Mfg., Inc. (TIEM), in Columbus, Ind., with orders currently being accepted. Toyota started in 1926 when Toyoda Automatic Loom Works Co., Ltd., now known as Toyota Industries Corporation, was established. Just eight years later Toyota's first automobile engine was produced: the A-type. With more than 150 million engines produced since 1934, Toyota is certainly seasoned in producing quality engines - but not just for automobiles. In 1956, Toyota began manufacturing engines for industrial usage, such as lift trucks. Today, more than 3 million of Toyota's smaller 4Y lift truck engines have been built.